Coach Jason Strange has not ruled Keelan Giles out of the Wales Under-20s team this season. Uncapped Ospreys wing Giles, 19, was named in the Wales senior squad in the autumn, but has not played since injuring a hamstring in January. Wales U20s face Scotland on Friday, 24 February and will take part in the U20 World Championship in June. "Keelan's got another two years with us, but the fact is we exposed him last year," said Strange. The coach says he does not expect Giles to return ahead of the game against Scotland U20s. He added: "If we do then fantastic, if we don't then we've got the benefit of the likes of Ryan Conbeer and Corey Baldwin." Giles for the U20 World Championship or Wales tour? Asked if Giles could be considered for the World Championship in Georgia, Strange replied: "We haven't looked that far at the moment. "I'm sure they'll be discussions on-going post Six Nations, but that'll be something to talk about then." Giles was a key member of the Wales team that won the Under-20s Six Nations Grand Slam in 2016. 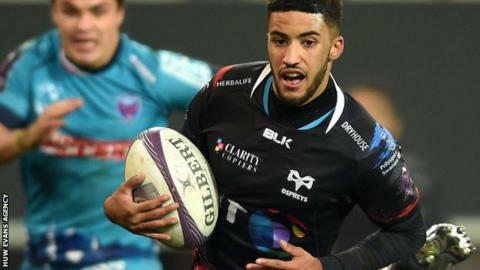 He was called-up for the autumn senior Tests by Wales coach Rob Howley after a series of eye-catching displays for the Ospreys in which he scored 11 tries in seven appearances. Despite being included in the match-day squad for the game against Japan in November, Giles was an unused replacement as Wales scraped a 33-30 win. Giles returns to action for the Ospreys against Munster in the Pro12 on Saturday, 18 February. His availability for the Junior World Cup could depend on the number of senior players called up for the British and Irish Lions tour of New Zealand in the summer. Wales have a two-Test tour to the Pacific Islands in June when they play Samoa and Tonga, and Giles could make that trip. Before then Wales Under-20s travel away to play Scotland in Cumbernauld after England ended their hopes of achieving a second successive Six Nations Grand Slam. "We know it's going to be a difficult challenge going to Scotland," said Strange. "I think we're still at the stage where we don't need to analyse Scotland too much we just need to focus on our own game. "Our expectations haven't changed. We expect a lot from the group and hopefully we can show that in the next three games."